Holidays can underscore everything that is wonderful in life. Especially in America, where life is so busy, where there’s rarely time off from the grind, holidays allow us a chance to be human, to enjoy our relationships … to enjoy our family and friends. For many, it’s a time when we come home. Maybe our jobs have taken us away from our extended families, or our wanderlust has created a land distance between the place we grew up and the place we’ve planted ourselves. Holidays allow us to touch … again. Touch, hug, and kiss our parents. Embrace our brothers … tightly hug our sisters. It fills what Facebook and Skype can’t provide. But the same thing that underscores life also underscores what’s missing. Parents, who only a couple years past were welcoming you home for the holidays with their embrace, their holiday feast, are now gone. Siblings, spouses, maybe even children … people who were mainstays in our lives … are no longer there to share in the life of Christmas morning, of New Year feasts, of presents. And what is meant for rest … what is meant for life … becomes a time that creates unrest as it all accentuates what’s missing … or rather who’s missing … from the family table, from the celebrations. The busyness of work, of kids, of our schedules comes to a screeching halt during the holidays and all of a sudden we have time to remember. We remember the holidays past. The joy. The hugs. The love. The life that is now missing. And all the grief that we thought was over all comes flooding back into our hearts and our minds. If that’s you. If you’re the person who will be met with the unrest of death during this holiday season, I want to ask you to do something. When you’re with your family and friends this season, take time to remember your loved one who has recently passed away. Before the meal, or during the game, speak up and share something like this, “Hey guys, I just want to say that I love you all and I really miss ______ this year.” That’s it. Or, if you want to go on, share your favorite holiday memory of your loved one. And if you haven’t lost a loved one recently, I encourage you to love EXTRA HARD this holiday season. Live! Hug! Speak your love over your family and friends! And when the festivities are done and they’re leaving to go home, make sure you tell them that you love them. If you really want to be an angel this holiday, visit or call or send a card to someone you know who has recently lost. A simple “I’m thinking about you this holiday” goes a very, very long way. 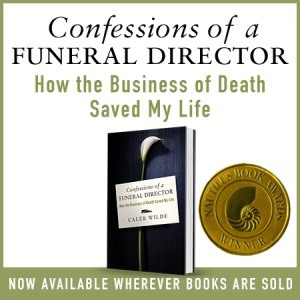 And one final thing – and this comes from the authority that only funeral director possesses – if you’re at odds with a family member or a friend, no matter how ugly the dispute or no matter how hurt your pride, life is simply too short to hold a grudge. Give your family, your friends and yourself the greatest gift you could possibly give this Christmas – a gift that reflects the real reason of Christmas – and forgive. I hope you all have a wonderful Christmas! I love you all. This entry was posted by Caleb Wilde on December 23, 2011 at 2:21 pm, and is filed under Religious Holidays. Follow any responses to this post through RSS 2.0.You can leave a response or trackback from your own site.